Patch up those already artfully patched pants and start thinking about edibles, because the remaining members of the Grateful Dead are reuniting for one final set of shows this summer. 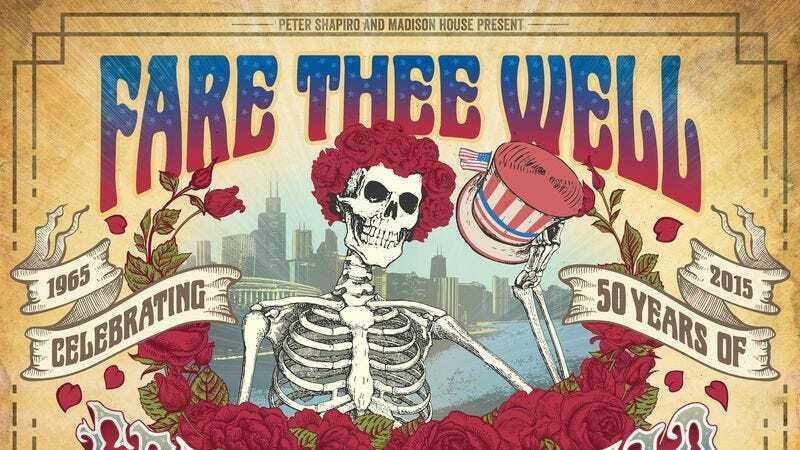 Fare Thee Well: Celebrating 50 Years Of Grateful Dead will take place July 3, 4, and 5 at Chicago’s Soldier Field and will mark the group’s final performance together ever. (Or so they say.) Mickey Hart, Bill Kreutzmann, Phil Lesh, and Bob Weir will be joined by Bruce Hornsby, Jeff Chimenti, and Phish’s Trey Anastasio and will ramble out two sets of music a night. Keeping in tradition with the band’s original organization, tickets, which start at about $60, will be available via a first-come, first-served mail order system, though they’ll also be available via an Internet pre-sale and through Ticketmaster. The last time Hart, Kreutzmann, Lesh, and Weir played together was almost 20 years ago and also at Soldier Field.